Posh chairman Darragh MacAnthony during his exclusive interview with the Peterborough Telegraph. Chairman Darragh MacAnthony insists one of his proudest achievements at Peterborough United is making his club one to be feared and respected in League One. MacAnthony made his point during his exclusive, wide-ranging interview with the Peterborough Telegraph yesterday (April 11). Chairman Darragh MacAnthony and manager Darren Ferguson celebrate a Posh promotion in 2009. He was asked what he was most proud of, apart from three promotions and a cup final win at Wembley, from his decade as Posh owner. “I’m most proud of making Peterborough United a feared club in League One,” MacAnthony stated. “That wasn’t the case before I got here. “I read opposition managers and fans showing us great respect when they are about play us. We have a reputation in League One that has been earned by our success. 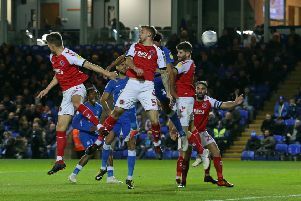 “Okay, the last couple of seasons we have reached the top six before Christmas and then fallen away, but at the start of every season we are seen as a promotion contender and I am proud of that. “It should be appreciated a little more that this happens every season. We received stick when Orient beat us in the play offs the other year, but look at where they are now. “Fans kept telling me how well Gillingham were doing last season and that it was because they didn’t sell their best player Bradley Dack. “Well they faded as well and they are unlikely to sell Dack for a lot now. I am proud of the fact we have not become one-season wonders like other clubs. “In 10 seasons I have a 40% success rate as we have won three promotions and a cup final at Wembley. That’s not a bad strike rate for little old Peterborough with their small crowds. “We’ve done so well, other clubs have copied our policies. “Of course I have been disappointed with the last couple of seasons and I’ll take my share of the blame. I don’t want Peterborough United to tread water. MacAnthony’s biggest regrets in his decade at Posh involve his most successful manager Darren Ferguson. The pair steered Posh to back-to-back promotions in 2007-08 and 2008-09. “I shouldn’t have sacked Darren when we were bottom of the Championship in 2010,” MacAnthony admitted. “That was a mistake I regret. I should have even given him a relegation. He deserved that. “I also should have given him a break after we were relegated from the Championship at Crystal Palace in 2013. He wanted one, but I didn’t want his relationship with the club to end that way. There is much more from the MacAnthony in tomorrow’s (April 13) edition of the Peterborough Telegraph.